I trust you didn't pick up any medical advice from him? Or financial either... yikes! That unnamed member of the other team is looking good, Canseco looks a little demonic. Great pic and great story. 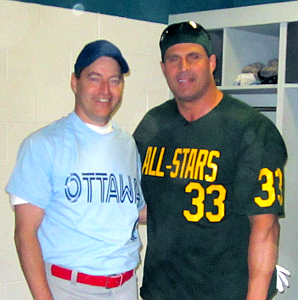 It's not clear whether Jose Canseco is the guy on the right or the left. You should have captioned the picture. @Big Cajun Man: Jose is actually a very nice guy. He was tireless signing autographs and taking pictures with people. @Dan: I agree that the similarity of physiques is striking. @JoseCanseco & @EvanMalamud,, they put on a great event for a great cause! hats off to both for job well done!